We had a good crowd at The Tobacco Hut on Saturday - Scott R arrived early and I'm glad I did too as he was passing out money! Lou fattened his wallet a bit from some lighters he had Scott sell on eBay for him and I received a check for some graphics work I did for Scott. This was Scott's final visit to the Hut for awhile - he's going to be a snowbird, heading to upstate New York for the summer. He'll be enjoying the summer in his hometown only returning when the weather finally becomes bearable here in late October. I, for one, am quite jealous. tobacco that was too moist. While I was trying to light up my Crown Viking freehand with some G.L. Pease Westminister, Scott was showing off a couple new pocket knives he has acquired. These were some real beauties, each with polished bone handles and one sporting a "hawkbill" blade, so named for its unique shape. Someone suggested that it would be good for skinning a deer, but Scott explained that the shape wasn't designed for it. I jokingly asked if it would be good for skinning a man, and he looked at me with a steely gaze, unwavering, until I finally looked away, quite frightened by the whole encounter. Okay, I made that last part up. Anyway, bon voyage and safe travels to Scott! I mentioned I was trying to light my pipe. Allow me to explain. I probably should have gone with a different tobacco today, because when I opened the jar at home to load the pipe, I noticed that the tobacco was extremely moist. If I had an hour or two to set a bowlful's worth of the stuff out, I would have, to let it dry. Unfortunately, I decided to load it up and try to make it work. I also made the mistake of packing it too tightly. 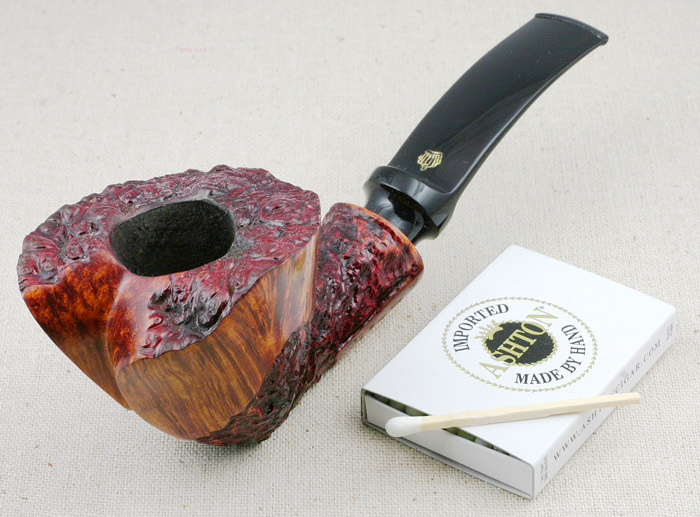 The combination of too moist and too densely packed tobacco made for an unpleasant smoking experience. I had to keep re-lighting it and probably should have just emptied the pipe out from the beginning and loaded back up with some of Lou's Baker Street. But it had been awhile since I'd enjoyed the Westminster so stuck with it. Joe K, Peter G, Tom L, and Jim C were also in attendance. I was glad to be wearing my "Think Outside the Fox" t-shirt, to ward off the attacks from Joe and Tom. Tom and I actually agreed on something...how the big banks and investment companies have essentially colluded with the government to stick it to the country. He cited a documentary, Inside Job, which explains a lot of how we ended up where we are today. Definitely something I'll have to add to my Netflix queue. Peter and I had an interesting discussion about, of all things, the history of the phone system. I had discovered a fascinating website, Atlanta Telephone History, and I learned that Peter's father had worked for Ma Bell in Massachusetts. Jim C and the rest of us talked a little about how we survived the apocalypse from last weekend, but supposedly Harold Camping, the pastor who predicted the whole thing, has now backpedaled and is claiming that the Rapture will actually occur in five months, in October. Hopefully Scott will be back by then to share one more smoke with his Tobacco Hut buddies. Don't forget the Father's Day Celebration at the Hut on Saturday, June 18th, from 1-4 PM. There will be lots of food, drinks, and prizes. Lou is lining up stuff now from his vendors to be raffled off.